Because of that fact, I have run into many other moms who have kids with the same issues and don’t know what to do about it, or have had no success in treating their kids going the mainstream route (Ritalin, anti-seizure meds, ABA (therapies like speech, occupational, and physical to treat autistic symptoms). By the grace of God, we have had success or improvements in treating our kids going the all natural route. I’ve spent many hours reading and researching about ADHD, seizures, autism, diet, supplements, biomed, Tourette’s, yeast, viruses, toxins in the environment, etc. I’ve talked to many parents who are curious and want to know more about what we have done with our kids. Since I have spent so much time learning everything I know, it’s often hard to sum it up in just a matter of minutes, so I’m going to try to compile everything in my blog so that people can get a more thorough understanding. You can also read as much or as little as you want! 🙂 I know for some people, the things I say can feel offensive, but that’s not my intent. I’m just sharing what I have learned and what has worked for us, and sharing my own personal opinion. Everyone has the right to their own opinion. If you read something that offends you – sorry! But for others, this information can be a God send and could literally save a child’s life. 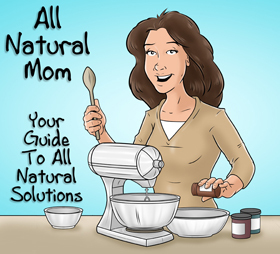 Going the all natural route and changing your child’s eating habits is not easy, but it’s definitely worth it. My hope is that at least one child will benefit from what their mom’s learn here, and save that family and child a lot of pain and grief. 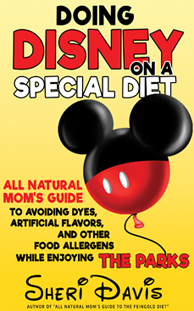 I’ve compiled (and will be adding) lists and information for the diets that we do. I want to make it as easy as possible for those who want to start any of these diets, to be able to do so without the confusion and overwhelming feelings that I had when I started all of these. There’s a lot of information out there. If you try to learn everything all at once, you’ll have what I call a TMI (Too Much Information) breakdown. A good chunk of the information I have learned has been from other moms who have taken the time to answer questions and share their experiences. 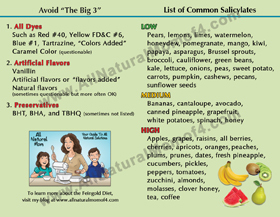 I’ve learned a lot from the Feingold board (you have to be a member to go on), and the www.gfcfdiet.com forum, which is a yahoo group that is open to all. It’s like this little underground group of “Moms Helping Other Moms”. It’s kind of like what Jenny McCarthy is doing. When you’re a mom and you see your child suffer, you can’t help but want to help or prevent any other child from going through that if you know what has helped your child, and know that it could possibly help another child. It’s like if you knew the cure for cancer, but told no one and watched your friends’ children suffer from cancer. How could you keep quiet? Anyways, like Jenny McCarthy says, “I know why God gave me a child with autism.” Because she plans to use that to tell the world the dangers of vaccines – and she’s doing a great job! I’m not upset that God gave me children with issues. I’m thankful. If they didn’t have these issues, I would have never changed their eating habits or our lifestyle choices, and then where would we be? I’m SO thankful to God that I decided early on not to vaccinate my kids based mostly on my mommy instinct and God’s grace. Had we vaccinated, I’m sure my daughter would have severe autism and Dylan may not even be alive because of seizures. Sometimes things in life seem hard in the beginning, but in the end it’s the easier way. I’d rather deal with the inconvenience of diets and healthier choices now, than deal with cancer and disease years later. Changing the diet for an ADHD child is hard at first, but then all of sudden you have a calmer child who is no longer getting into trouble at school and you suddenly have a much more peaceful home. I’m not saying my children are going to be free of disease and cancer (because we all live in a very toxic world), but I’m going to do whatever I can to minimize that chance and give them the best start in life and pray that they continue to make wise choices for the rest of their lives. Many people say, “We’re all going to die from cancer anyway so who cares.” My perspective is that my kids are not going to go down without a fight. I also believe that if you are a Christ follower, you should treat your body as a temple of the Holy Spirit, because that’s what it is. God gave us these bodies and we should show respect for our Creator by taking care of them as best we can, because our health can be taken away in a second. ← Got Milk? Got Ear Infections? I'm so glad you did this blog I love everything Im reading on your site. 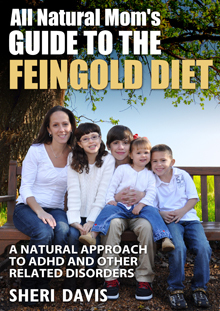 I already do a GF diet for my whole family(myself, my hubby, and my 3 yr old) and I am starting on the Feingold diet because of the issues he is having. He is also a biter and hiter and just very over stimulated but also can be the sweetest thing in the world. I too am very spirtually minded and appreciate your comments regarding God and Jesus you dont find very many people like minded 🙂 Thanks again for all your hard work on this blog. As my don gets older we are def going to homeschool him and I have already enjoyed your advise on those issues.